Collections of digital documents can nowadays be found everywhere in institutions, universities or companies. Examples are Web sites or intranets. But searching them for information can still be painful. Searches often return either large numbers of matches or no suitable matches at all. Such document collections can vary a lot in size and how much structure they carry. What they have in common is that they typically do have some structure and that they cover a limited range of topics. The second point is significantly different from documents on the Web in general. The type of search system that we propose in this book can suggest ways of refining or relaxing the query to assist a user in the search process. In order to suggest sensible query modifications we would need to know what the documents are about. Explicit knowledge about the document collection encoded in some electronic form is what we need. However, typically such knowledge is not available. 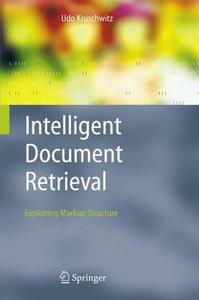 This book describes how that knowledge can be contructed automatically. This book demonstrates how document markup structure can be used to construct domain models for collections of partially structured documents shows how such knowledge can be utilized when searching the document collections presents two implemented search systems which demonstrate the usefulness of this approach.